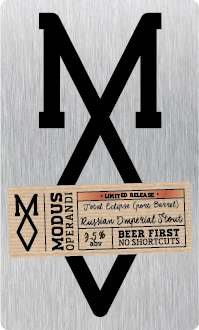 To help them reflect on the best of the year just gone (and it has been a rather good one), for their first birthday the team at Modus Operandi are tapping a special treat in the form of a Russian Imperial Stout. Or, rather, two of them. The original beer was brewed six months previous before being divided in two, with some going into Bimbadgen Estate port barrels and some going into Lark distillery whiskey barrels. Having been torn apart, left sitting around for six months, wondering what to do and always kept in the dark, they’ve been busy taking on the characters of their respective barrels – think charred cherry and rounded oak respectively – which are added to a base recipe that was designed for an intense, raw, dark chocolate roast flavour. In the depths of a particularly cold winter, there’s little in the universe as magical and wondrous as a big Russian Imperial Stout and this one certainly is that, clocking in at 9.5 percent ABV. It’s released officially at Modus Operandi’s birthday celebration on Saturday 25 July and will be tapped simultaneously at a handful of venues in Sydney, Melbourne and Brisbane. If you’re looking for a little light in your life, you’re bound to find love in the dark of the Total Eclipse.